Our annual reports detail ISTE news, highlights and accomplishments over the year. Read about these and other exciting initiatives in our 2018 Annual Report. In 2017, ISTE focused on resetting and recommitting to new work and new ways to measure impact. ISTE 2017 in San Antonio featured more sessions and learning opportunities than ever before and was the launch pad for the ISTE Standards for Educators (formerly the ISTE Standards for Teachers). 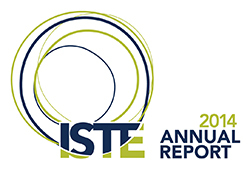 Other annual highlights include the completion of a three-year grant from Verizon that trained thousands of educators on mobile learning, the creation of myriad resources to support the adoption and implementation of the ISTE Standards, and the renaming and reimagining of the quarterly ISTE member magazine. Read about these and other exciting initiatives in our 2017 Annual Report. 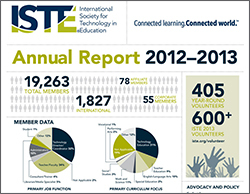 In 2016, multiple ISTE initiatives helped influence education transformation worldwide. From the ISTE Conference & Expo in Denver, to the release of the refreshed ISTE Standards for Students, to bold advocacy spotlighting the need for thoughtful edtech policy and funding, ISTE’s work focused on empowering learners and providing the resources to help educators dream big. Read about these and other exciting initiatives in our 2016 Annual Report. Our 2015 annual report details ISTE news, highlights and accomplishments over the past year. 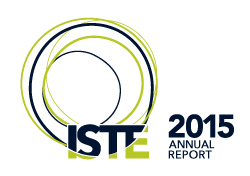 Our 2012–13 annual report details ISTE news, highlights and accomplishments over the past year.